STATE FLAG -- On March 26, 1918 the state flag was officially adopted. The design was not finalized until June 14, 1962. The flag is the State Seal on a blue background, the same blue as in the United States flag. 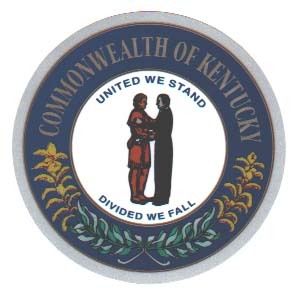 STATE SEAL-- The official insignia was authorized in 1792, six months after Kentucky became a state. The motto is believed to be from "The Liberty Song," popular during the American Revolution, and a favorite of Isaac Shelby, Kentucky's first governor. The design shows "two friends embracing with the name of the state over their heads: and around them, the following motto 'United we stand, divided we fall'." Below them are two sprigs of goldenrod, the state flower. Don't miss any pages, see the sitemap.